Augusta National Clubhouse 1836 or 1937. Photo taken as part of the Historic American Buildings Survey. 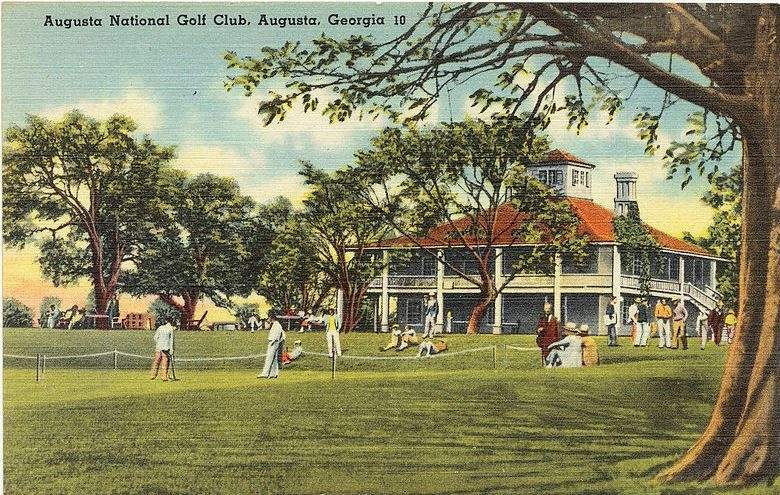 Just four years after Augusta National opened, its clubhouse was catalogued for the Historic American Buildings Survey. The program was begin in 1933 as part of an effort to document the United States architectural heritage. It was conceived by Charles E. Peterson of the National Park Service to provide work for a thousand out of work architects — and not incidentally, create a record of what were rapidly disappearing historical buildings. The plan I propose is to enlist a qualified group of architects and draftsmen to study, measure and draw up the plans, elevations and details of the important antique buildings of the United States. Our architectural heritage of buildings from the last four centuries diminishes daily at an alarming rate. The ravages of fire and the natural elements together with the demolition and alterations caused by real estate ‘improvements’ form an inexorable tide of destruction destined to wipe out the great majority of the buildings which knew the beginning and first flourish of the nation. The comparatively few structures which can be saved by extraordinary effort and presented as exhibition houses and museums or altered and used for residences or minor commercial uses comprise only a minor percentage of the interesting and important architectural specimens which remain from the old days. It is the responsibility of the American people that if the great number of our antique buildings must disappear through economic causes, they should not pass into unrecorded oblivion. The list of building types . . . should include public buildings, churches, residences, bridges, forts, barns, mills, shops, rural outbuildings, and any other kind of structure of which there are good specimens extant . . . . Other structures which would not engage the especial interest of an architectural connoisseur are the great number of plain structures which by fate or accident are identified with historic events. Peterson, Charles E., to the Director, United States Department of the Interior, Office of National Parks, Buildings, and Reservations, Washington, D.C., November 13, 1933. Reprinted in the Journal of the Society of Architectural Historians 16, no. 3 (October 1957): 29-31. The program continues today under the National Park Service along with the Historic American Engineering Record and Historic American Landscapes Survey. The images and records are housed in the Library of Congress. Entry for the Augusta National Clubhouse in the Historic American Buildings Survey. Augusta National Clubhouse 1937. Photo taken as part of the Historic American Buildings Survey. I find it interesting that it also is called Bedford and The Hill. There is no real hint of the stature to which it would attain in the future. That’s to be expected, though. The interest in the clubhouse at the time was that it was built as part of the historic Fruitlands Nursery. In 1853, Benjamin Warren sold 315 acres of land to a farmer named Dennis Redmond. Calling the property Fruitland, Redmond grew peaches, apples, grapes and other trees and shrubs. In 1857, Redmond finished a large house on the property, which would become Augusta National’s Clubhouse. That same year, Redmond sold half his interest to Prosper Berckman, a Belgian immigrant who had studied horticulture. A year later, Berckman bought the remaining 50%. With Fruitland, Berckman began shipping Georgia Peaches to the New York Market. By 1861, Fruitland was producing more than 300 kinds of peaches. Surviving the Civil War, Fruitland became a vast mail order business, mailing out some 25,000 catalogs a year through the 1880s. Berckman died in 1910, and the business passed to his sons. The property was sold in 1925 to a developer for a winter resort. That idea didn’t pan out and in 1931, it was sold to Augusta National Golf Club for a reported $70,000. The photos taken for the Historic American Buildings Survey show a rather ordinary looking building. However, a postcard painted circa 1940 shows a much restored clubhouse.